Perhaps surprisingly, New Zealand Rabbits are the very first truly American breed of rabbits. Their genesis is tied much more to Belgian Hares than it is to rabbits from New Zealand. The very first New Zealands were Reds. We’ve chronicled the early history of New Zealand Red Rabbits here. It is also the history of New Zealand Whites, as they are nothing more than albino sports of the early New Zealand Reds. A printed article about New Zealand Red Rabbits circulated in 1918 about rabbits imported from New Zealand to California. The article connected them to the newly developing breed of rabbits known as New Zealands. While the alleged imports may or may not have contributed to the breed that would bear their name, the establishment of the New Zealand Rabbit is now understood to be a completely American story, since the breed arose in multiple locations concurrently across the USA, with or without any New Zealand imports. New Zealand Whites first showed up in the nestbox of a New Zealand Red doe in 1917. Four albino bunnies showed up in the same litter of seven kits. The fact that one was a buck and three were does must have looked to the breeder, Mr. William Preshaw, like a gold-embossed invitation for the development of a new variety - White New Zealands. Two years later, in 1919, Mr. Preshaw showed his "White New Zealands" at the Stockton, California Fair. They were met with huge interest. By 1920, Mr. Preshaw was advertising "Pure White New Zealand Rabbits" for sale. The rabbits bore only slight resemblance to the New Zealand White Rabbits of the Twenty-First Century. In 1920, New Zealand Whites were stocky and white, but they tended to pose in a modified arch much like their progenitors, the Belgian hares. Black New Zealands first occurred around 1924. However, today’s New Zealand Blacks were bred by Dr. Alfred DeCastro with Black New Zealand sports from California breeders. The variety was accepted by the ARBA in 1958. It is our understanding that Blue New Zealands are being developed through a Certificate of Development from the ARBA. 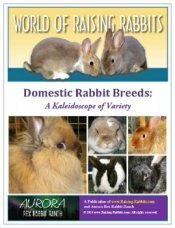 Today, New Zealand Rabbits have been bred nearly to perfection. They give other breeds very stiff competition for the coveted Best In Show award. The majority of New Zealands in the USA are in very close conformity to the breed standard of perfection. Judges have to get picky in order to rank the entries. There is no resemblance in today’s New Zealands to the Belgian Hare breed. New Zealands are now the epitome of a meat producing breed - firm, meaty, full depth and breadth of hindquarters and slightly less so in the shoulders. They are posed flat to the table rather than arched. 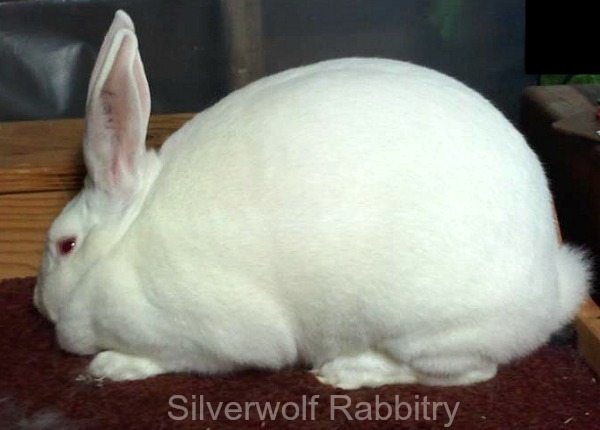 New Zealand Whites are the breed of choice for most commercial rabbit operations. Until recently, white fur was preferred as stray hairs would be less noticed against the pale meat. Additionally, white fur can be dyed to a color of choice, if desired. Fryers gain weight rapidly, reaching 5 pounds by 8 weeks or close to it. New Zealands have enjoyed rising popularity since the mid 1920’s. That’s a lot of years of breeding, line-breeding and at times, in-breeding. Over the years, some recessive disorders have arisen in New Zealands. See Autosomal Recessive Disorders to learn more. On the other hand, the same frequency of breeding can lend itself to test-breeding and eliminating the same recessive disorders that may have been uncovered. 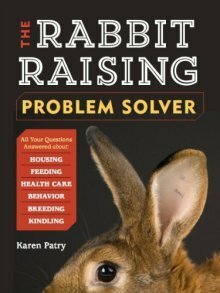 Nevertheless, if you’re thinking of raising meat rabbits or starting a commercial rabbit herd, you may wish to ask questions about any recessive disorders in the rabbits you’re considering for purchase. 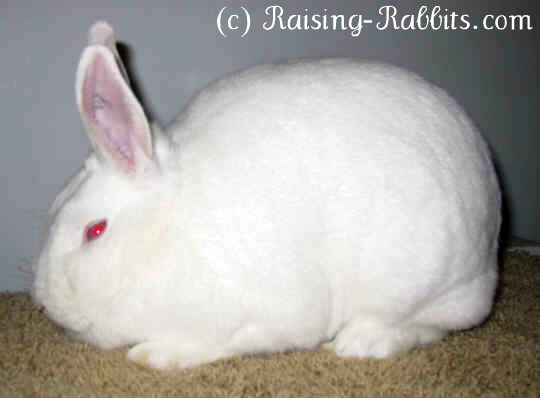 Other than ensuring genetically excellent foundation stock, you can hardly go wrong in choosing New Zealand Rabbits as a meat rabbit or as a show breed. Had a NZ White male when I was 3 years old!! I have been raising N.Z. for 12 years with lots of success.